I genuinely don't know how to take this tweet sent out by the England Twitter team. "Mothers, partners, and daughters" by England. 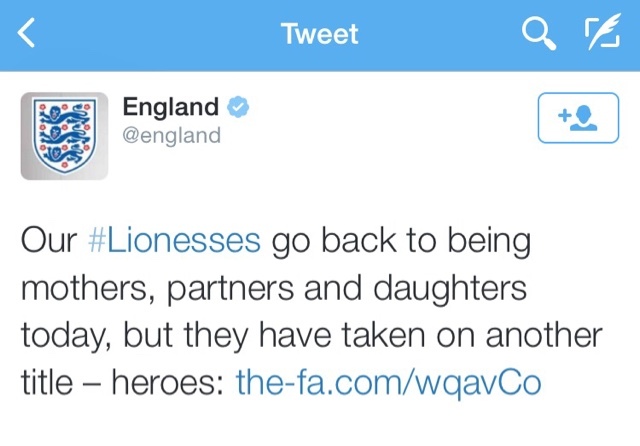 I would like to hear your thoughts on this tweet sent out, is this a tweet honouring the women's team or just a way of reminding the women that they have other roles in life off the pitch. I don't think that I've ever seen the men's team reminded that they have to go back to being, fathers, serial love cheats and sons, have you? I'm extermely disappointed in this tweet. It is, of course an honour to be a mother, partner, daughter. But even more so it's an honour to be a person in your own right and we all should be considered so. This terminology is patronsing and diminutive and fails to properly celebrate the sporting success this England team achieved. Correct me if I am wrong but those ladies are professional athletes no? Just because the tournament is over, they surely remain professional footballers too? That wasn't just the sum total of their careers... At the same time, did they not continue to fulfil their roles as Mothers, Partners and Daughters during the tournament, or were their kids temporarily orphaned?? yep. Such a shame that whoever tweeted the above didn't get it. No, it's fine, women. You can stop pretending at playing men's games now. Get back in the kitchen and make me a pie! I'm hungry now. Wanna make me a sandwich? That be wimminz work that be! I don't like the tone of it at all - "jolly good show, girls, now - shoes off, fetch me a beer, and I'll have you knocked up again before supper, scoff scoff" - it's so patronizing. They're professional sportspeople. SPORTS PEOPLE. Anti feminist, sexist sentiment, patronising and ridiculous, to reduce them in this way, to remove the fact they and be many things and simultaneously as we all are demeans them. Being a parent is not demeaning but the context of saying they will now return to being everything but sportspeople is what is wrong here. Don't they surely just go back to their lives much the same as male athletes do without this sort of condescending drivel? !